Summary: Teifi Pools are a series of lakes and reservoirs which can be found in the remote countryside of Ceredigion in mid Wales. It is wild, seemingly untamed countryside; harsh farmland at best. A walk around here, if you ignore the roads and reservoir dams which have tamed some of the pools, is like a walk in the past. It felt like for me anyway; the practically deserted country is stark and wild, a landscape of ethereal beauty. While on a short walking break in mid Wales with friends I visited this sparse place. The mist and drizzle which accompanied us on the walk added to the sense of walking in a bygone time. The Walk: What a difference in twenty four hours. Yesterday we had climbed Cadair Idris on a wonderful clear day. Today we had woken from our Aberystwyth slumber to a dark overcast morning of persistent rain. The team; Chris, Dave, Steve and I dressed for walking action as we normally do but rather than make haste in the rush to get going we were unrushed. A cafe breakfast was a rare treat for us, we ate it at leisure while the rain continued to pound the ground outside. "Surely it cannot last all day" I said, more in hope than expectation. The forecast was not good. 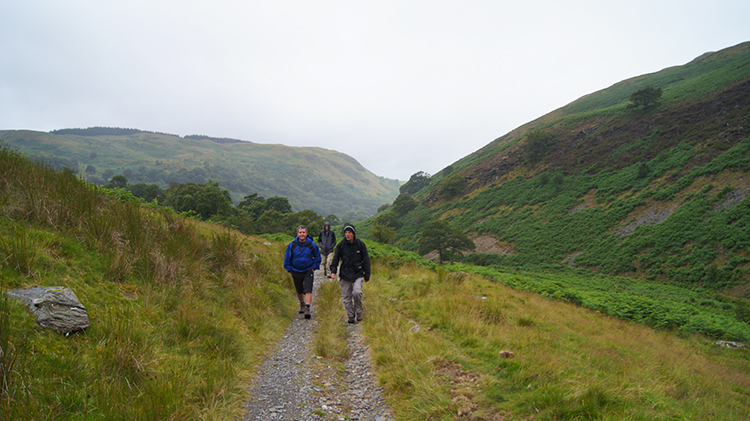 We were in Ceredigion for four days of walking and day one had been great with good weather which had allowed me to lead the lads on a lovely day exploring the uplands and summit of Cadair Idris. They had never been on the classic mountain before and had thoroughly enjoyed it. Today's dismal dank day offered no such high level adventures but as with such walking trips I had a few walking options banked. At breakfast we had chosen this one. An interesting car ride from Aberystwyth to Tyncwm via Devil's Bridge, Pont-rhyd-y-groes, Ysbyty and Pontrhydfendigaid was the prelude to the walk, during which I bored the lads silly with tales of my walk along the same roads we were now driving during my 2013 Wales Coast to Coast walk. I guess they were glad to get out of the car and set off on the walk. Especially as the rain had just stopped for the first time in the day. 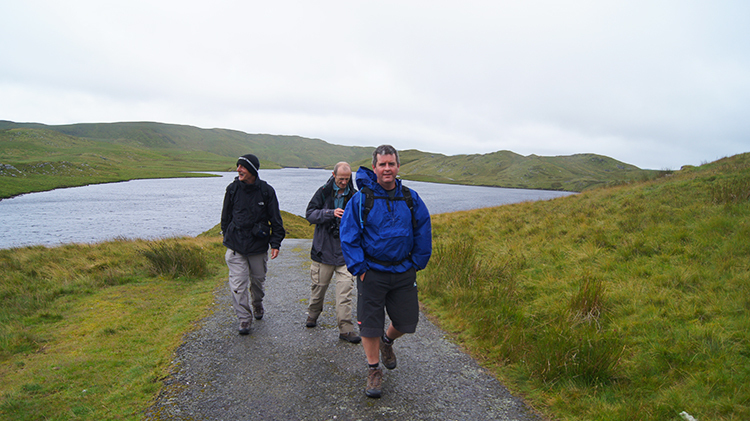 And so we began with a temporarily rain free walk to Teifi Pools. There was no another soul in sight. The only life we came across on the stark walk up the Nant Egnant valley were a line of sheep coming down a track in single file who looked surprised to see us approaching them and the Buzzards and Red Kites patrolling the slate gray sky. 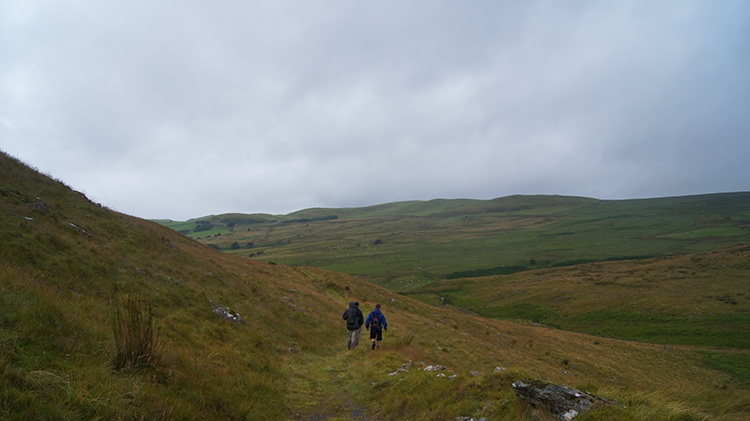 We were already in high country, the walk having started at over the 200m altitude level which we would up to 450 metres at Teifi Pools. 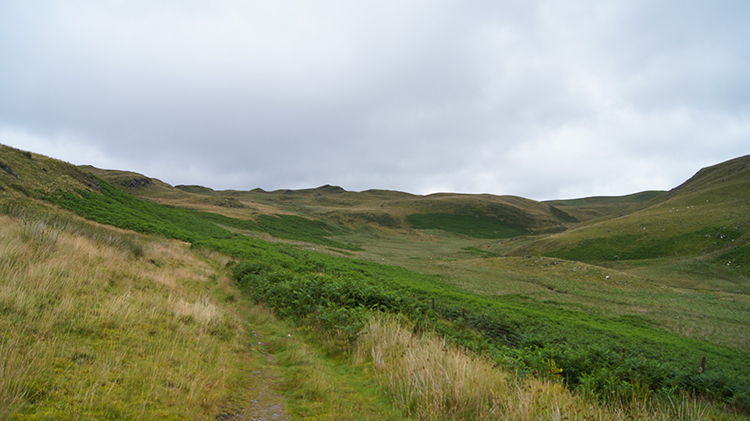 The landscape of the Nant Egnant valley was typically austere upland habitat of harsh course grasses and ferns. I could imagine John Craven, Tom Heap or Adam Henson saying "Tough sheep farming country. Hard to eke a living out up here". Right enough, even those sheep we had passed had left this place for lower ground. As we reached the head of Nant Egnant at Banc Blaenegnant it was just us. 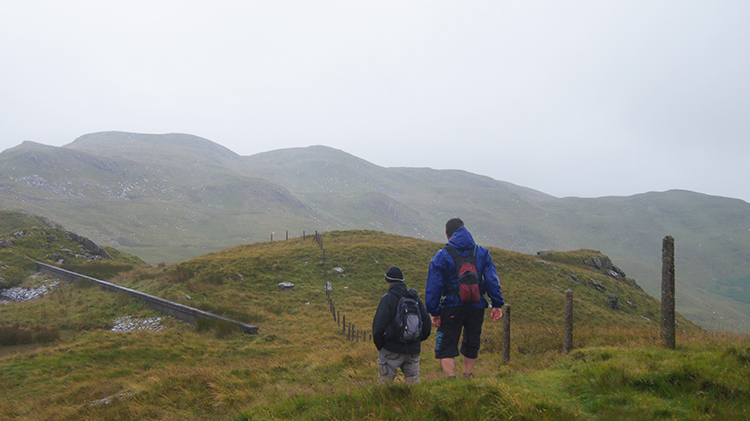 We came to view the first of the Teifi Pools as we crested over Banc Blaenegnant. Llyn Egnant which feeds the stream we had followed up the valley of the same name was spread out before us. I had read beforehand that Llyn Egnant is full of wild brown trout so both Chris and Steve would have enjoyed a fish had they the tackle while Dave and I would have preferred to wander about. 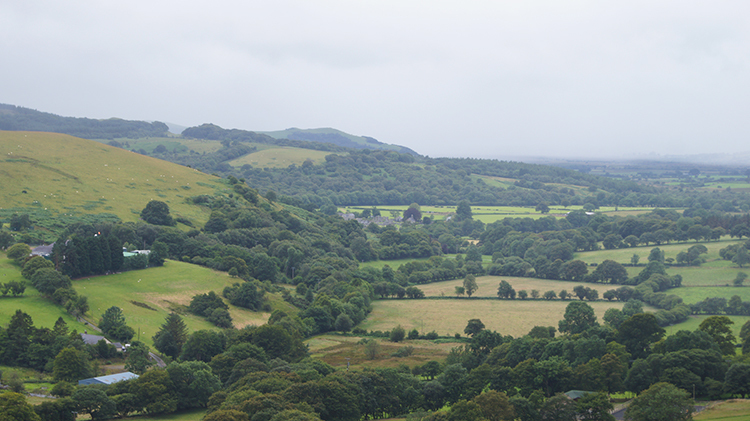 Despite the dismal weather I could see the countryside here is simply stunning. 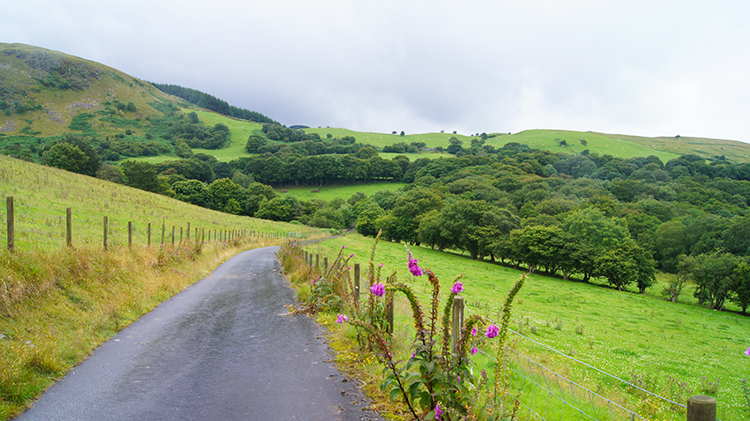 There are fewer more remote places in Wales. We were in wilderness. 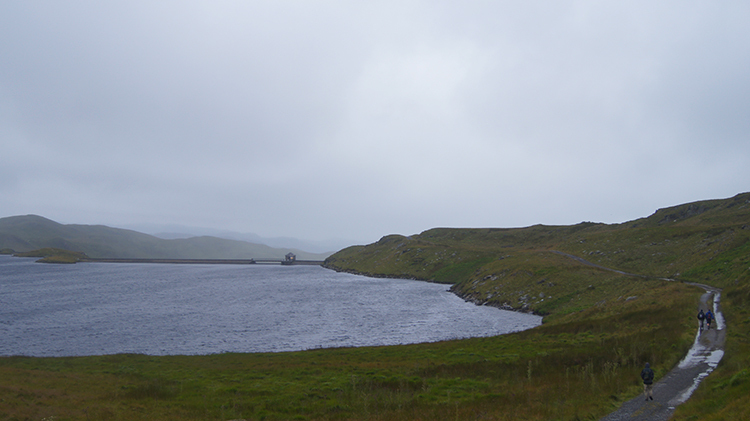 The lake is surrounded by small knarled hillocks, lots of them. These small hills are evidence of the glacial activity that formed the lakes which can also be realised by the deposited glacial erratic stones scattered around the Teifi Pools. On reaching the near shore of Llyn Egnant we had left the unmade and sparsely tracked moor to follow a tarmac road, laid courtesy of Welsh Water who have tamed some of the pools with dams, pools now reservoirs which included Nant Egnant. 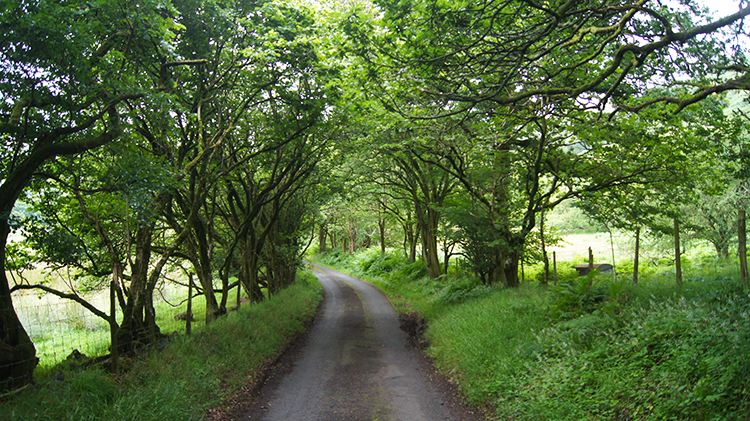 e followed the road along the west bank of Nant Egnant and then followed it as it turned from northwards to westwards, going up and down on its undulating roller coaster way over the glacial hills. The slate gray cloud filled sky was still burdened with water and it began to fall from the sky again as we walked the tarmac road. The lads grinned and bore it as I cursed. At least the joys of looking at fresh Teifi Pools relieved my disappointment with the weather. 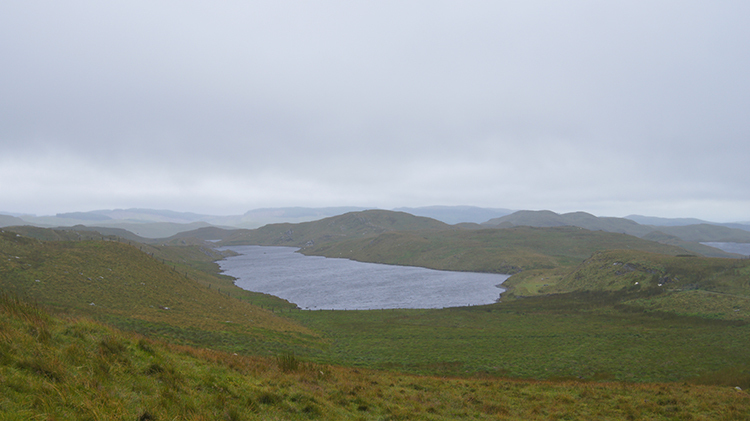 I spotted Llyn Hit to my left and Llyn y Gorian just beyond. A little to the right of Llyn Hir I noticed Llyn Teifi for the first time which we should soon see up close. 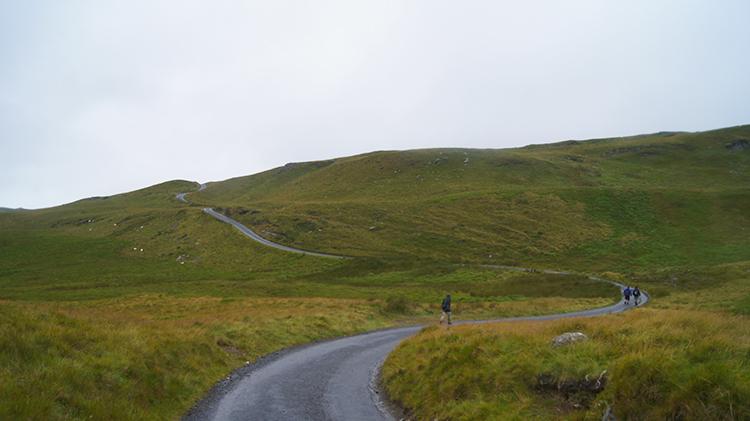 First more undulating tarmac road though, in a rainstorm. It was head down and look at the tarmac time. 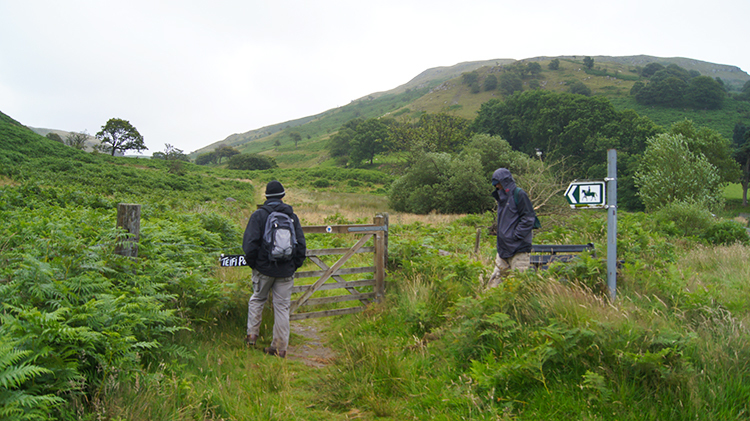 We followed the road which ended with a final climb to Craig y Rhiplem, the high point of the walk. Having left the road near to a Welsh Water information board which advised us not to swim we headed down over an erratic strewn hill towards the north-west edge of Llyn Teifi. The skies darkened somewhat as we did so, the rain petering down and making walking a little more uncomfortable for a while. Then it relented again, making its mind up I suppose. I must have wished properly. The rain stopped on the walk down to the reservoir. The air was damp and we were unlikely to dry off. But at least we had a respite. 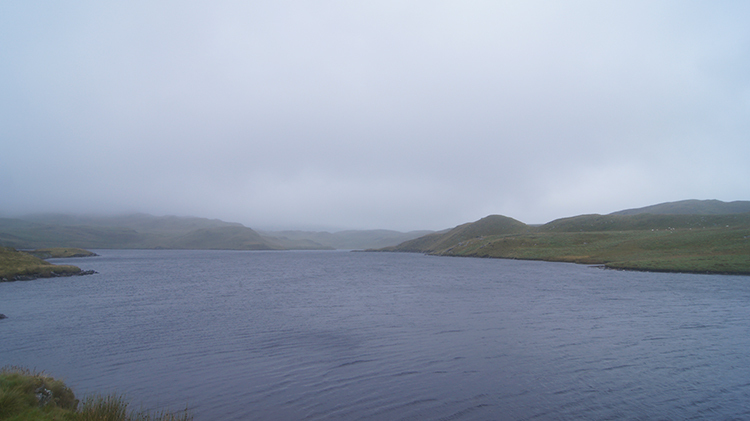 Llyn Teifi is the biggest of the Teifi Pools and is the actual source of the River Teifi which flows for 73 miles until it flows into the sea at Cardigan. 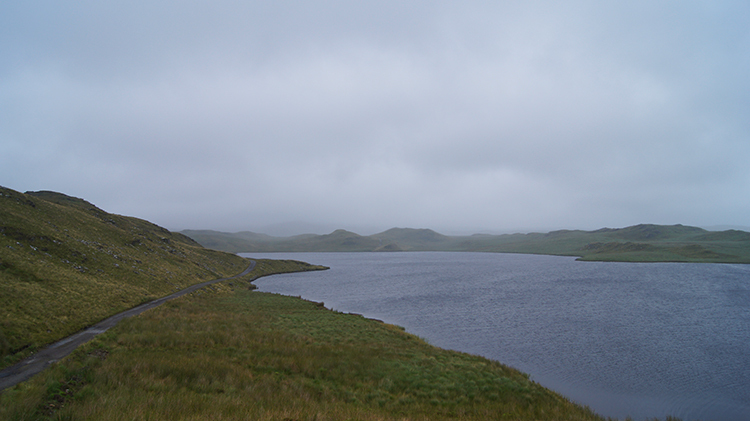 As with Llyn Egnant the Teifi is popular with anglers for its stocks of wild Trout. 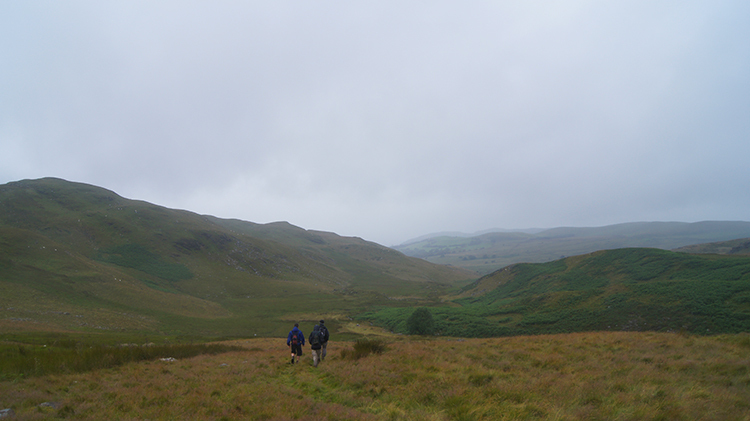 None were here today, it was still just the four of us battling the terrain and wet weather of this part of mid Wales which ironically is known as part of the 'Desert of Wales'. Not likely I thought and certainly not today. 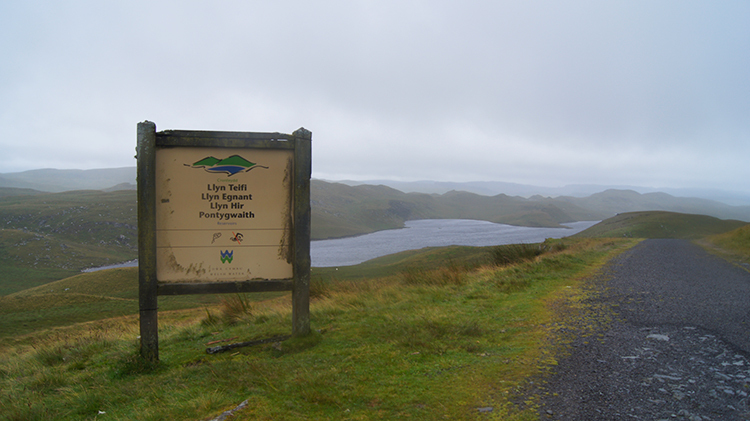 We continued our walk by walking on a path alongside the west side of Llyn Teifi and then we crossed the dam wall to enter true wild country. 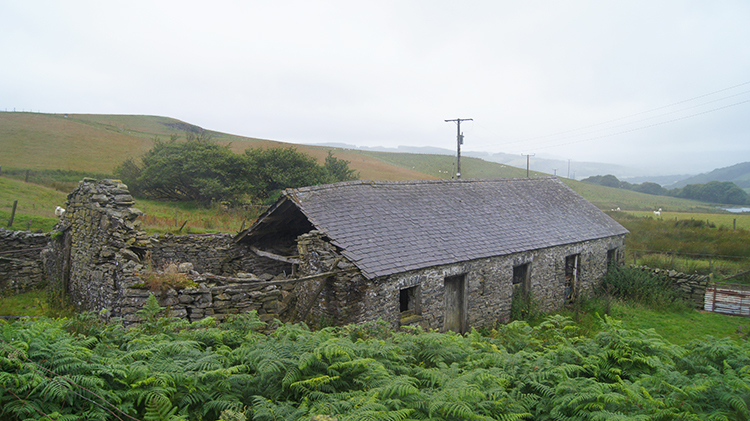 There were no access roads now, no dams and little evidence of man's intrusion on the landscape at all as we crossed hinterland from Llyn Teifi towards the abandoned farmstead at Frongogh. It was wild indeed and the paths which were indicated on the map and corroborated by walking book descriptions were sparsely evident on the ground. At times we took our own course across the ground which was often bog. Rich absorbent water retaining ground for the pools but not good for the human foot to cross without squelching under the water level. We just about managed though I was distracted by the rich colours of bog land plant life which included bryophytes, sedges and vascular plants. Also and more identifiable were cotton grass and cranberry. I learned these bogs around the River Teifi contain the most intact surviving examples in the UK of a raised bog landscape. Thus it was a privilege to admire it as I did. By the time I had done so the lads were a fair distance ahead of me. They waited at Frongogh. At Frongogh I met up with the lads who had their heads set back and looking straight up into the sky. I looked up to see what had captured their attention and saw two birds performing aerial aerobatics directly above us. Surprisingly the birds were of different species, one a Red Kite and the other a Buzzard. We expected them to be in battle but it appeared that they were courting each other. Not likely but they were not fighting, nor showing any aggression towards each other. Were they showing off their flying skills. That is how it appeared as the circled each other closely without ever touching or making an aggressive move. hey each showed off to the other up close for about a minute before flying off in different directions. We all agreed we had never seen the like of it before. It was a minute of magic. From the abandoned farmstead at Frongogh which seemed to have been deserted for quite some time we climbed a short distance up a field side which gave us a splendid view across to the east. The ruins of Strata Florida Abbey framed the centre of the picture which was dominated by a patchwork of tree lined fields on the valley floor. 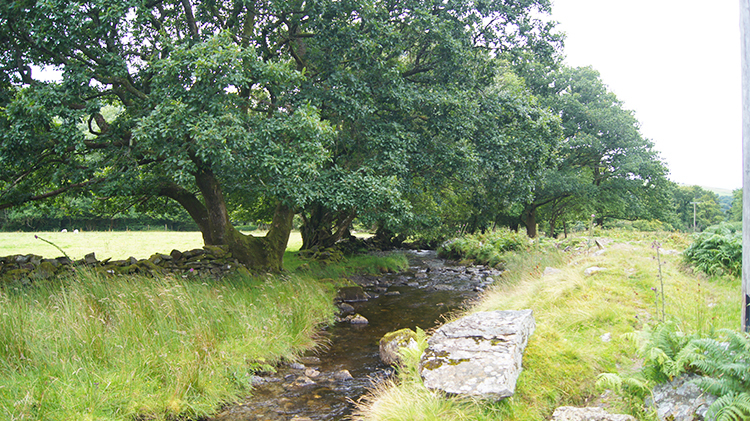 An unbroken line of trees gave away the course of the young River Teifi, flowing closely past the abbey. The walk in back to the car from Frongogh was a delight bar one short and severe downpour which saw all four of us sprint quickly from the trail to some field side tree cover. We cowered in as close as we could to the Hawthorn without getting spiked by sharp defensive thorns. They don't discriminate between us who simply wanted sanctuary from the storm and sheep who want to feast on their tasty green leaves. The storm was very heavy but lasted no more than five minutes. We were soon on our way again on a farm lane edged by fields, fresh sprightly green grassed fields, refreshed by the rain of the day. As we finished our walk by following Afon Mwyro a very short way back to the car the air dried. The sky remained slate gray which It would all day. Yet, in some weird way it made this Teifi Pools walk all the more memorable. Brooding, unpopulated, unpolluted, natural, hinterland.